The adjacent picture depicts a UL-142 Atmospheric Storage Tank Type 316L Rib Tank. 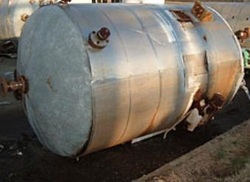 The tank is gauge material and is designed, constructed and bears a UL-142 label. This is one of the most unique thin-walled vessels in the United States. Evans Tank and Services has the knowledge and experience to develop a balance between economy and vessel useable life to optimize your project dollar. This is a depiction of an API-650 Standard Storage Tank which is designed for low pressure per Appendix F and in Stainless Steel as per Appendix S.
Evans Tank and Services also does design in exotic metals as well as base quality carbon steels with the agreement of their customers. Designs are also available in API-620, Underwriters Laboratory, and the American Steel Tank Institute. This is a depiction of an ASME Section VIII, Division 1 Type 304 Stainless Steel Pressure Filter. The vessel has a pressure rating of 125psi at 380-degrees Fahrenheit. 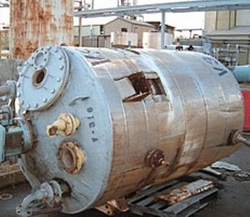 Vessels designed for 1,000psi and up are not uncommon to Evans Tank and Services. Our design services include welding certification and corrosion data. Evans Tank & Services, Inc.